This isn’t news to any of you but we’re trying to cram so much stuff into our day that we have stopped doing some of the simplest things that make lasting memories for our families. I remember as a child always preferring restaurant food because it seemed so fancy. But as I sit here writing this post for you I can’t think of a single restaurant meal I loved as a child. What I remember is the amazing roast beef my mother made. Falling off the bone, crowded by tender delicious chucks of potatoes and carrots, my mouth waters just thinking about it. I haven’t eaten meat in over 10 years but if I walk into a house and smell roast beef cooking, I always have a flashing thought that being a vegetarian is stupid. That I am missing out on something really special. When I still lived at home, part of our birthday celebration always included the home cooked meal of our choice. I wondered why we didn’t ever go out to dinner for my birthday, but now? I cherish the memories of the chicken stroganoff I chose every year for my birthday dinner. Cook for your children. Our memories around good food last forever. Even if money is no object and you can afford to pay someone to prepare every meal for you, it’s so worth it. One of my favorite things to make from scratch is pizza. It’s versatile, fun to make and so much better than any pizza that can be delivered to your house. A few years ago I was on a quest to make the perfect pizza dough. I scoured the Internet, read millions of blogs, tried dozens of recipes. In the end I found the best pizza dough for me was a simple recipe I found on the Cuisinart website after I received one of their food processors as a gift. The ingredients are simple, the recipe is fast and easy and it makes perfect dough. 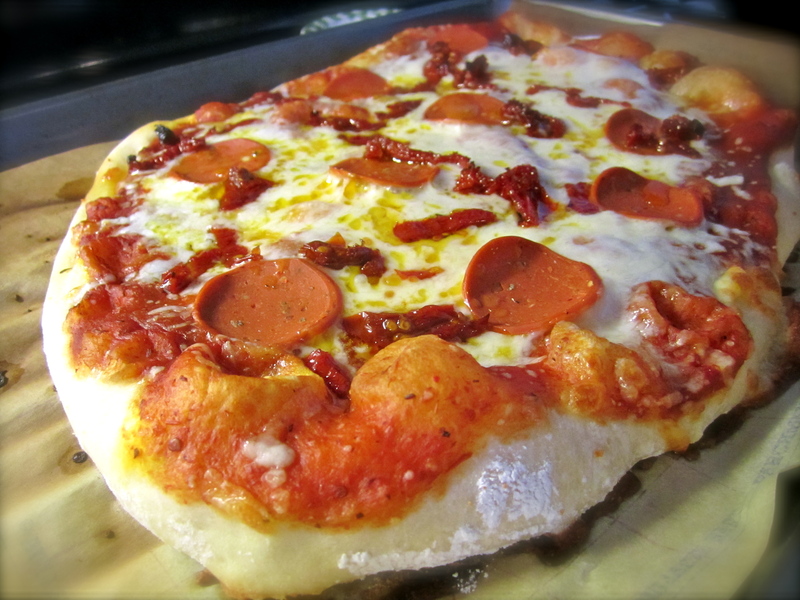 Pizza dough can be frozen for later use or made into smaller crusts and pre-baked then frozen for quick meals. The biggest lesson I learned from The Pizza Investigation is that the key is to cook the crust really fast. Preheat your oven at the highest temperature possible then cook the pizza for about 10 minutes. Don’t use pre-shredded cheese because it’s coated with some type of cornstarch, which prevents it from sticking together, but also affects the melting process. Lastly, put the cheese in the freezer for about 15 minutes prior to topping your pizza with it. Otherwise, the cheese will burn in your extra-hot oven before the crust is done. I can honestly say I don’t know a single person who doesn’t like pizza. And when you make your own, you can make it as simple or exotic as you like. My husband loves a plain cheese pizza. My favorite is anything involving goat cheese and sun dried tomato. And today when my family came over for dinner I even tried barbecue hash brown pizza inspired by Julia at SnarkyVegan. Making pizza is fun. The magic of watching the dough rise, the challenge of seeing how thin I can roll it out. I realize that pizza isn’t the healthiest food out there but making it from scratch allows more control over the ingredients and somehow making a great pizza is always the most gratifying cooking experience for me. I hope you’ll try it and come back to share your experience.